Sorry for going Dark again. You probably forgot about me. Those of you who are divorced know the dark times, and they often revolve around dating. This time, it started out sort of sunny. Standing my ground that it isn’t wrong or abnormal to want a partner in crime, I got into another relationship with high hopes – no Pavlov here. Every time it’s like I forget how crushing it is when it crashes. So, I went in with open eyes and out with puffy ones. Damnit. Yes, I’ll get back up again, I’m used to it now, but come on! WHERE ARE ALL THE PRINCES? But as always, some mistakes made and lessons learned. 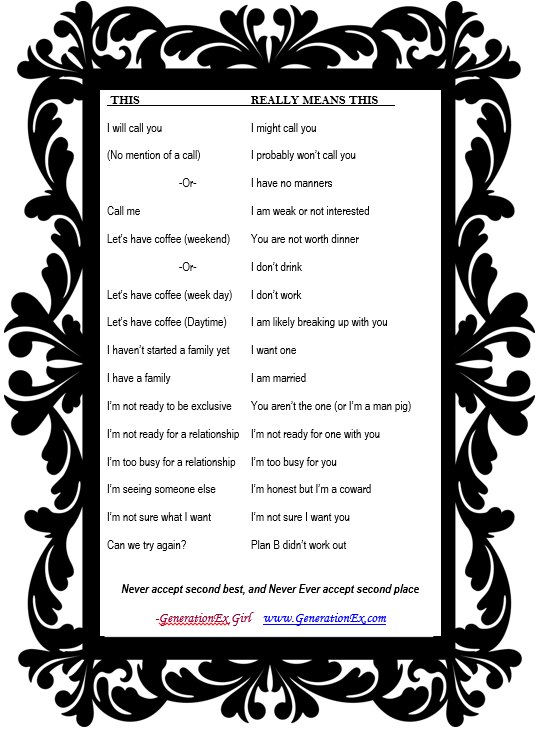 If I wrote all the takeaways from the past five years of divorce world it would take up an entire book (yes, still writing it) – so for this post – just a Dating Dictionary. I’m sure you are familiar with some of these. Hopefully that helps or at least makes you laugh a little. Back on the horse sans Prince….. will keep you posted!